Grilled Salmon, Tarragon Mayonnaise, Thyme for Cooking summer main course. Tarragon and chives are the first herbs to come up in the spring. They make a light mayonnaise perfect with grilled fish. Brush salmon with the oil and sprinkle with dill weed. Cook on barbecue grill 5 - 7 minutes per side, depending on thickness. OR put on baking sheet and roast in 400 F oven for 15 - 20 minutes, depending on thickness. Steaks will take a few minutes longer than fillets. Salmon should flake easily with fork when done but it's okay to have it still a bit pink in the center. Mix tarragon, chives, lemon, garlic and mayo. 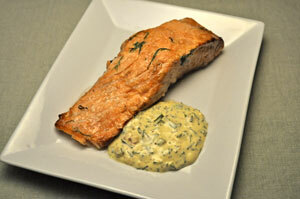 When salmon is done, remove to plates and serve, tarragon mayonnaise on the side.